Hortus Camdenensis | Rosa chinensis Jacq. var. odoratissima Lindl. Tea rose. George Don describes it as having semi-double, sweet-scented rose-coloured flowers. Raised from seed of Rosa chinensis Jacq. var. odorata, synonym Rosa x odorata Sweet, by Sir Abraham Hume and given the name Rosa indica v odoratissima by Lindley. It is figured in the Botanical Register in which John Lindley commented that it is the sweet-scented China Rose of the gardens. ‘This is the sweet-scented China Rose of the gardens which was originally raised from seed by Sir Abraham Hume, and by him distributed to the public. In the French gardens it is called, the Odeur de Thé Rose. It would be well if a few more of the newly-raised varieties of garden roses possessed an equal degree of merit to recommend them to attention, or at least as permanent characters to distinguish them, as this has, at once, the most fragrant and most delicate of the tribe. Our drawing was made at Messrs. Colvill’s Nursery.’ [BR f.804/1824]. It appears to differ little from Rosa indica var. odorata, except perhaps in more marked scent. 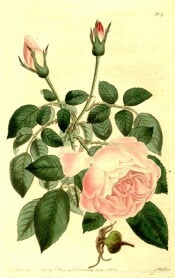 This rose was listed in Les Plus Belles Roses au début du XXe Siécle, edited by Charles Amat. Listed in all published catalogues [T.843/1843]. More details about Rosa chinensis Jacq. var. odoratissima Lindl. Rosa indica var. odoratissima Lindl.